Accrington’s town centre is set for a festive boost after Chamber of Trade members and SDA joined forces to launch this year’s Christmas flyer. The project follows the success of a 2013 Christmas leaflet drop which saw some businesses enjoy a 50% upturn in trade in the lead-up to the festive period. Now, traders have taken even more of an active role in Accrington’s December festivities by helping to organise special Christmas events too. A total of 45,000 Christmas flyers have been designed and printed by SDA in conjunction with Hyndburn Council. Hyndburn’s 36,000 homes will receive a copy of the flyer through their letterboxes, while each of the borough’s schools will also receive copies to send home with pupils. Leisure centres and libraries will also be stocked up with the flyer, which features around 50 Accrington shops and services as well as information on how to shop online at Accrington Market for collection or delivery. Hyndburn Chamber of Trade members Jim Saron from Bailey’s Menswear, Julie O’Hara from Barbara Kay’s and Raymond Astley from Archway Footwear are helping to organise two events taking in December. Saturday 13 December will see Broadway transformed for a Wonderful Winter Fayre, with free mulled wine, chestnuts and mince pies as well as children’s entertainment, rides, choir and jazz band. The following Saturday, 20 December, there will be a pipe band, family fun and Christmas markets in the town centre, while Santa will be giving away cuddly toys and sweets in the Arndale Centre from 12 noon until 3pm. The festive fun kicks off on Thursday 27 November with fireworks and a performance by Britain’s Got Talent’s Jai McDowall for the Christmas Lights Switch On event, while Santa’s Grotto in the Market Hall opens every weekend from Saturday 6 December. 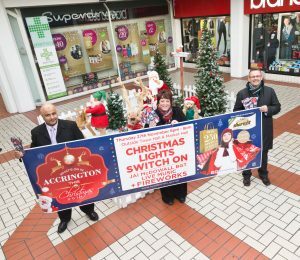 Zain Kiyani, centre manager for Accrington Arndale shopping centre, said: “We can’t wait to see children’s faces light up at the exciting festive events we have lined up as a town. Here at the Arndale Centre there’s free parking all year round, late night shopping and a brand new Blue Inc store opening too. For up-to-the-minute news follow @AccringtonShops on Twitter and Facebook. This entry was posted in Accrington, event management, Shop Local and tagged accrington, christmas, december, shop local on November 19, 2014 by admin. Christmas shoppers are beating a path to Padiham’s high street after SDA sprinkled some festive magic on a Christmas shops and services campaign. 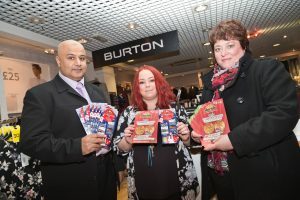 The town’s independent retailers joined forces with Burnley Council and SDA to create an interactive flyer aimed at boosting Christmas trade. SDA designed, wrote and produced the flyer following the success of similar campaigns run by us in nearby Accrington and Oswaldtwistle. 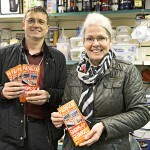 Featuring 21 shops and services advertising product offerings and promotional deals, the flyer is now being distributed to 37,000 homes in Padiham and surrounding areas like Read, Simonstone and Hapton, as well as being hand-delivered to primary schools, leisure centres and libraries ahead of the festive break. A total of 40,000 copies has been printed and distributed by SDA after our pilot campaign in Accrington last year saw some businesses enjoy a 50% upturn in trade during the run-up to Christmas. As well as shopping information, the flyer includes information about the town’s history, details of winter events and an overview of Padiham’s leisure facilities. 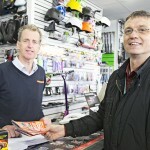 And it’s getting a big thumbs up from all the shopkeepers who feature in the campaign. A Twitter account set up by SDA just months ago to support the project is already approaching 2,000 followers. Follow @PadihamShops for all the latest news, events, information and offers. This entry was posted in Padiham, Shop Local and tagged padiham, scott dawson, shop local on November 11, 2014 by admin.